Although the majority of people sleep on their side or back, there is still a large number of stomach sleepers. This position is not recommended because of the strain it puts on your neck and shoulders unless you use a special pillow of course. A regular pillow may suit side or back sleeping positions, but it will not be the best pillow for stomach sleepers because it props the neck into an awkward upward position which affects breathing and spinal alignment. This causes pain on the neck and lower back. We know how hard it can be for stomach sleepers to identify the right pillow for them since the majority of pillows are geared towards people who sleep on their side or back. This is why our review includes the fundamental features you should consider before investing in one. We evaluated the height because a pillow that is too low or too high will affect the natural alignment of the neck with the spine. 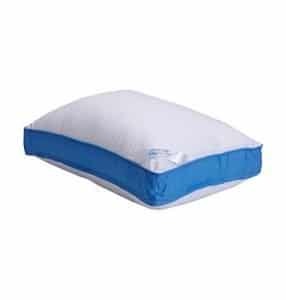 Additionally, we assessed the material used in the pillow and on the cover because it has a direct impact on the level of firmness, comfort, and breathability of the pillow. The right type of material will also eliminate allergic reactions. The above features coupled with reviews from verified buyers were extensively analyzed in a number of models to come up with our best pillow for stomach sleepers list. We then further compared the performance of our best models, based on their detailed features, pros, and cons, and captured the results in a comparison table. Next, we incorporated a buying guide which contains an FAQ segment and an in-depth exploration of the essential features any best pillow for stomach sleepers should possess. Finally, we summed up this review with an overview of our best three picks. This model is versatile for both stomach and back sleepers due to its flat sleeping surface on one side and a rounded shape on the other. It has an overall height of 2.5 to 2.75 inches and is considered medium to firm. The pillow is filled with gel-infused memory foam with an open cell design which improves air circulation and controls body heat build-up. The memory foam contours your head and neck while the low profile aligns the neck with the spine to avoid straining your back. The hypoallergenic foam is certified by CertiPUR-US. 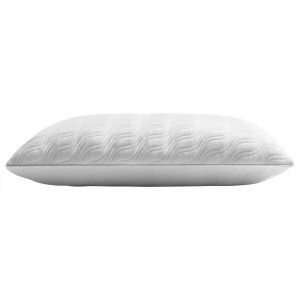 It features a special formula which eliminates the stiffness found in conventional memory foam. The outer cover is made of breathable 40% bamboo-derived rayon and 60% polyester which perform better than cotton at moisture wicking and odor-resistance. The cover can be removed for washing. Also included is an inner mesh cover which protects the gel memory foam. 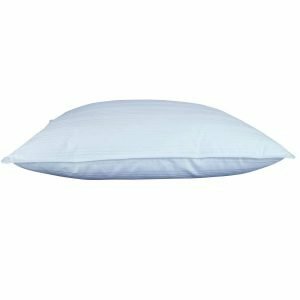 This is the best pillow for stomach and back sleepers who are looking for a low-lofted firm and supportive pillow, but you may find it too firm and flat if you prefer plushness. 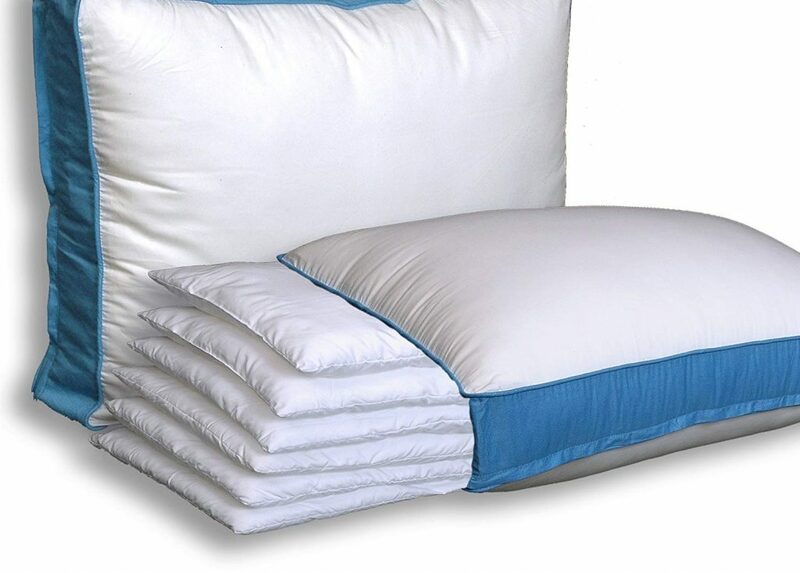 If you are the kind of sleeper who enjoys stacking pillows to customize them to suit your sleeping needs, then you will enjoy this adjustable multiple layer model that comes with six stackable flat pads. All the layers form a pillow that is approximately ten inches in height. The pillow layers allow you to customize the height for better support and comfort. They are able to compress without going flat since they do not shift around a lot. The inside is filled with microfiber polyester which provides a soft down alternative. 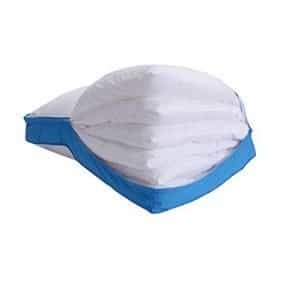 Stomach sleepers who are prone to allergic reactions can safely use this pillow because it is hypoallergenic. The outer cover is made of 100% cotton with a thread count of 300 to keep the fill from sliding out of the seams. Zippers on three sides of the cover allow you to add or remove layers to adjust the pillow to six different heights. You can even use some of the layers to make another pillow. 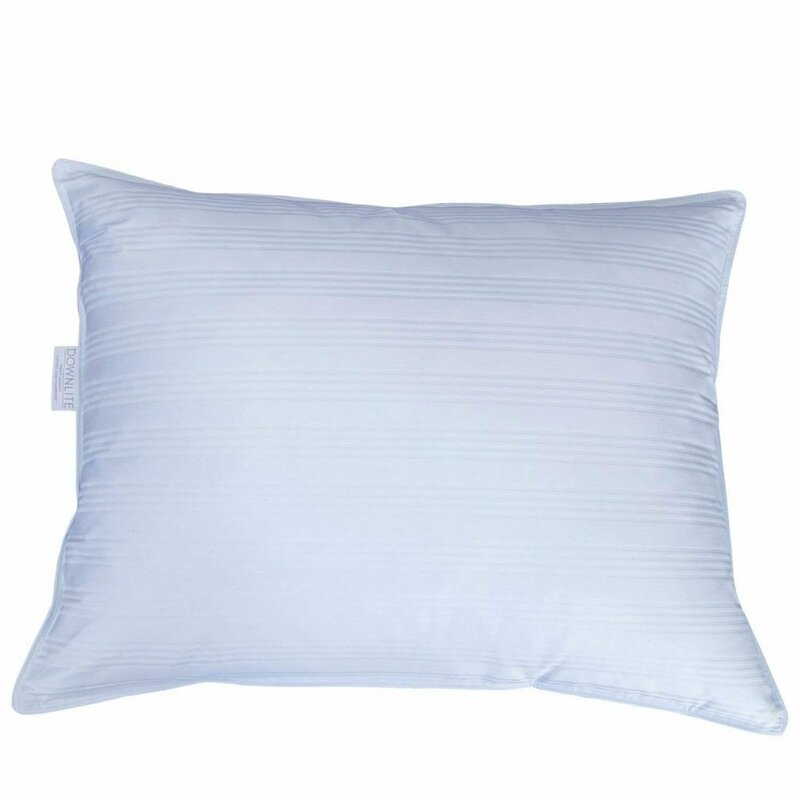 This kind of versatility makes this pillow one of the best pregnancy pillows for stomach sleepers because you can place it under the knee, pelvis, lower back or any part of the body to relieve pressure joints. It is an all-in-one pillow that can actually work for any sleeping position. Cleaning is a breeze because both the pillow and cover are compatible with a washing machine and dryer. The downside to this pillow is the filling material which holds onto heat and can also get lumpy. 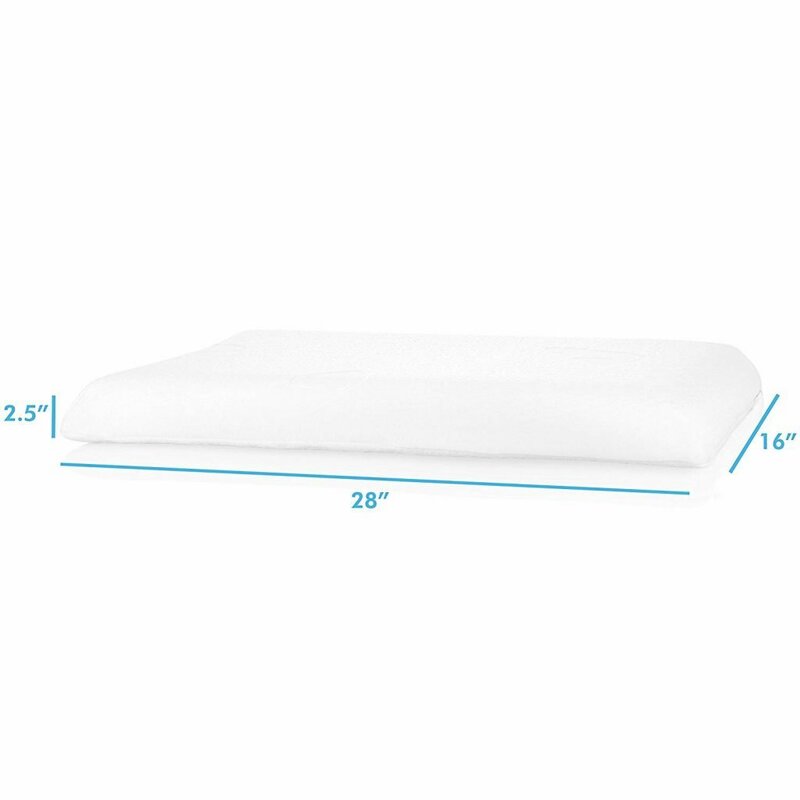 Describing a pillow with a height of five inches as slim almost sounds oxymoronic until you lay on it and you realize it compresses comfortably into a low loft of approximately two inches. 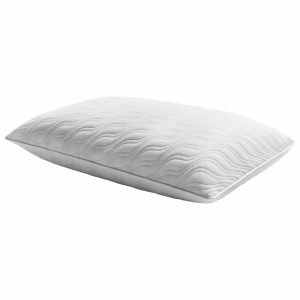 This plush compression is achieved by the shredded memory foam which fills the pillow. 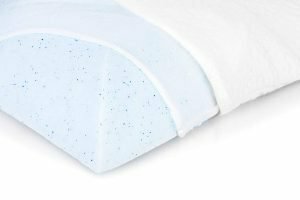 While conventional memory foam conforms to your shape and weight, shredded memory foam redistributes your weight uniformly for a firm sleeping surface. The open cell design of the CertiPUR-US-certified foam enhances air circulation and breathability in combination with the micro-vented bamboo outer cover. 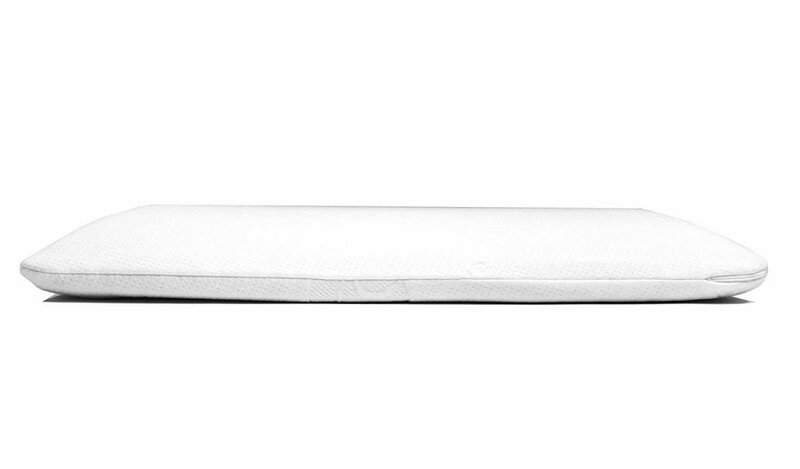 They also promote absorbency and eliminate heat retention. The removable outer cover can be washed safely with a washing machine. This locally made model comes in three different sizes that provide more options for stomach sleepers. It also comes with a six-year warranty and a 30-day money back guarantee. Although it is classified as firm, the majority of buyers consider it soft and plush yet supportive. You might be wondering how this pillow will suit you if you prefer firmer feel. Luckily, the shredded memory foam inside can be redistributed to achieve your desired level of firmness. This kind of flexibility makes this pillow ideal for everyone, and you will not have to break a bank to acquire it. 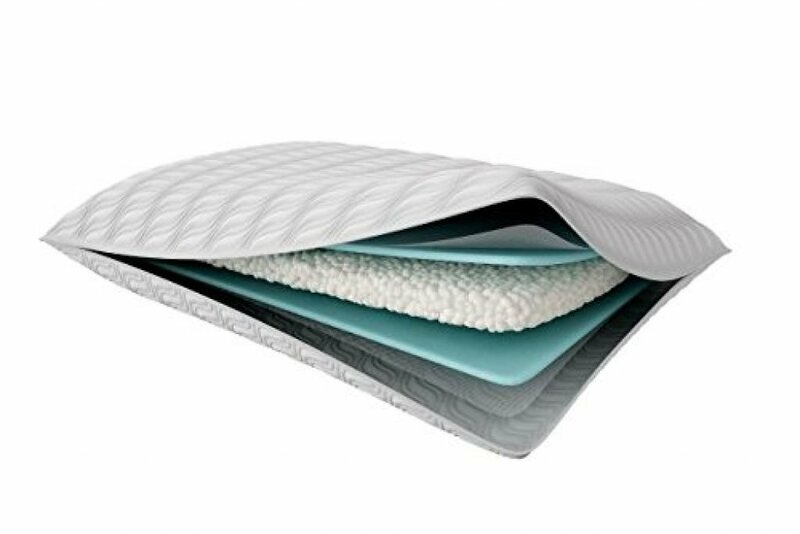 This pillow is ergonomically designed with a low loft and curved edges that minimize neck twisting, improve spinal alignment and increase breathability for people who sleep on their stomach. It is filled with memory foam infused with cooling gel to regulate temperature and keep your body cool. An inner pillowcase protects the memory foam from damage. This model is also safe for stomach sleepers with allergies because the foam is hypoallergenic, anti-microbe and resistant to odor. 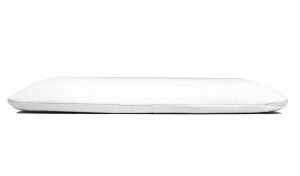 The thin profile with an overall height of 2.5 inches and medium firmness is comfortable to lie on because it strikes a balance between support and softness. Its cover is made of a combination of 60% bamboo and 40% polyester which is excellent at wicking sweat away from your body. The cover can be removed for easy washing. Several buyers, including side and back sleepers, have admitted that this pillow helped to lessen and eliminate their body aches. The only constant complaint is the initial odor that is associated with memory foam. The manufacturer offers a trial period of 100 nights for you to test the pillow and a full refund if it does not impress you. This medium-lofted plush pillow is undoubtedly the best value for money. 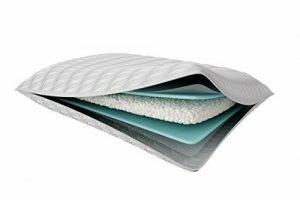 Since it is all-down, it is one of the best pillows for stomach and back sleepers because it offers a low profile and a highly-compressible sleeping surface, from six inches to almost flat. It can also be conveniently molded for use by people who sleep on their side. Inside the pillow, there’s 525 to 550 fill power of hypoallergenic duck down that is encased in a cotton damask cover with a thread count of 250 to prevent the down from poking out. The removable cover is compatible with washing machines. 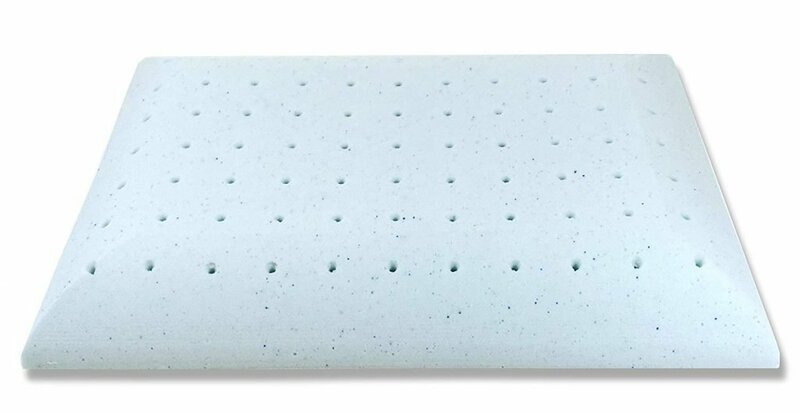 This model can be used as an additional layer to your firmer existing pillow for extra plushness and comfort, or on other parts of the body for pressure relief. You can mold the down filling to your preferred height and comfort. 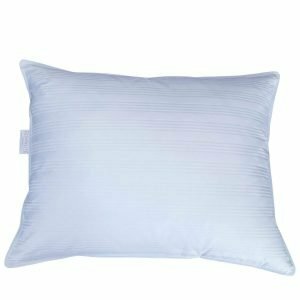 Buyers love the squishy and soft feel of this pillow as well as its ability to dissipate heat but a few have noticed the down material coming out after a couple of months. 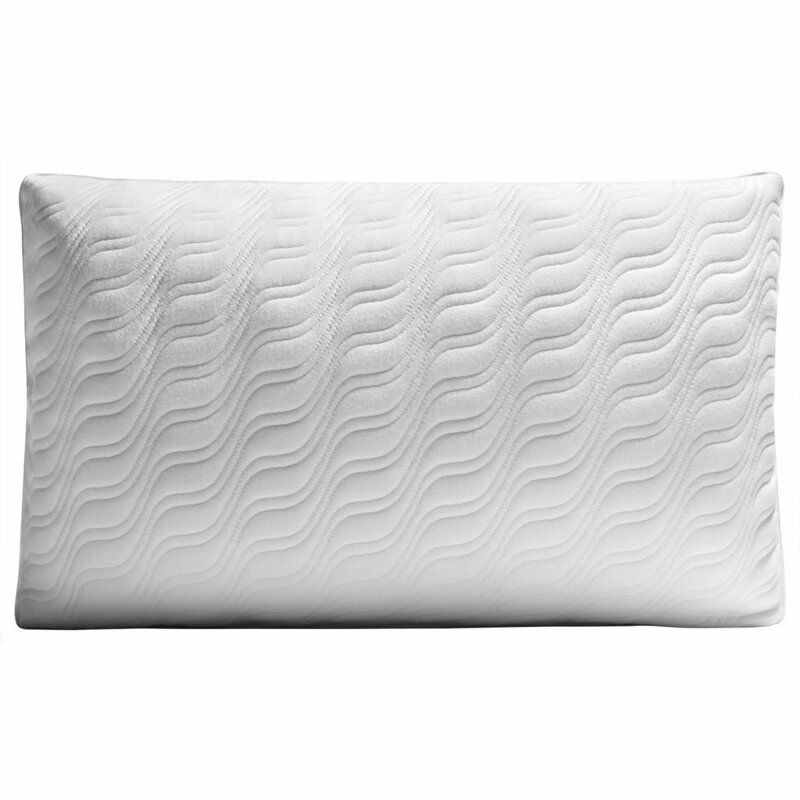 This is the best Tempur-Pedic pillow for sleepers who prefer a low profile with a balanced firmness that gently supports the head and aligns the neck and shoulders with the spine. 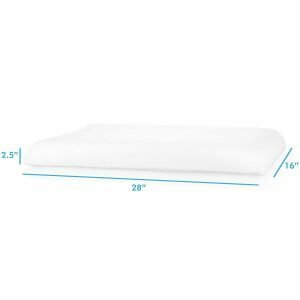 The six-inch high pillow is filled with memory foam that is known for its softness and responsiveness to your weight and temperature which minimizes motion transfer. Memory foam contours the body to relieve pressure and lessen body aches which develop as a result of stomach sleepers craning their necks to one side. 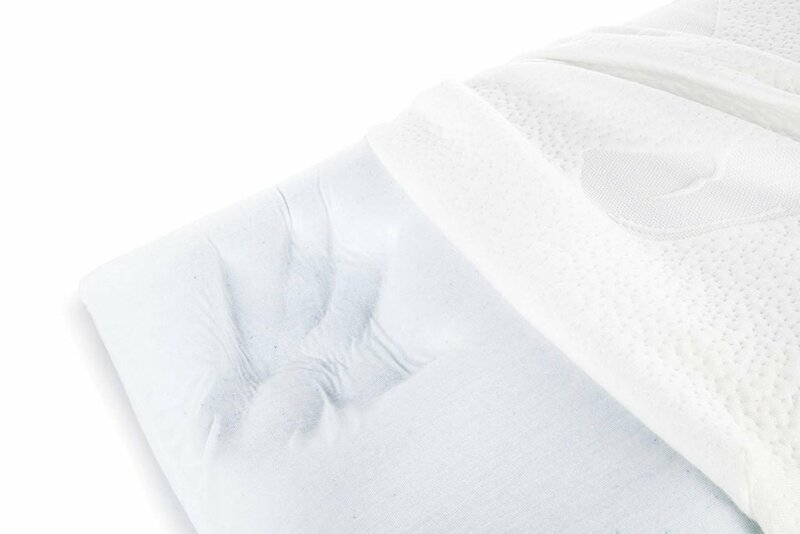 The soft and breathable outer cover made of premium quilted cotton can be removed and washed easily. This pillow is available in Queen and King sizes. Unfortunately, there is no trial period. However, the manufacturer offers a limited warranty of five years which will adequately cover you in case of any manufacturing defects. The only notable complaints from verified buyers are the ones found in every pillow model which uses memory foam: heat retention and an initial odor which dissipates after a few weeks. Stomach sleepers are not as common as side and back sleepers. Subsequently, there are fewer pillows designed specifically for them. This makes their search for the right pillow even harder and time-consuming. It is for this reason that we have included this informative section which you can use as a reference when making your decision. You will find more information on the essential features and answered questions in the FAQ section included in this buying guide. Is it safe to sleep on your stomach? Sleeping on your stomach is considered the unhealthiest sleeping position when you use the wrong pillow because a pillow that is too high or too low exerts pressure on the neck, spine and lower back. Craning your neck and twisting it into an unnatural position can also interfere with your breathing. 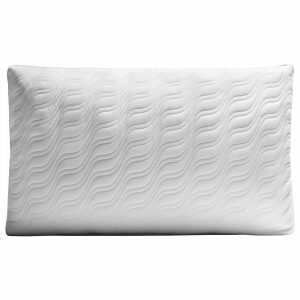 Otherwise, the best pillow for stomach sleepers aligns your neck, shoulders and spine for optimal support and comfort. 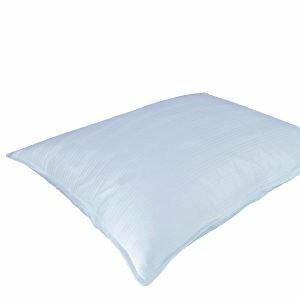 Below are the features that will help you select the best pillow letting you comfortably sleep on your stomach without the unhealthy consequences. Pillow height is also referred to as pillow loft or pillow thickness, and is calculated in inches. Firmness, on the other hand, refers to the stiffness and resistance of the pillow and is rated from extra firm to extra plush. We are going to discuss both because they go hand in hand but are not necessarily an indication of each other; a pillow with a high profile can be soft and compressible to a much lower height, such as DOWNLITE Extra Soft Down Pillow, while a low pillow like Bluewave Bedding Ultra Slim Memory Foam Pillow can be firm. The right height and firmness of the pillow will depend on your sleeping position, size and weight, firmness of the mattress, and pillow placement. The ultimate goal should be to properly support your head in a natural position and align your neck and shoulders with the proper curve of the spine to avoid neck stiffness and back pain. 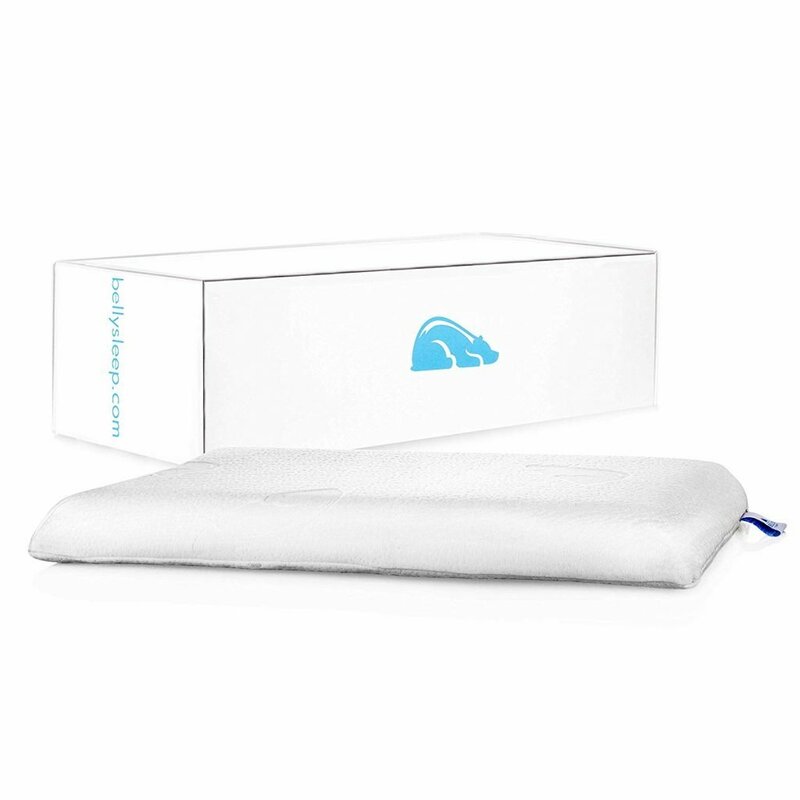 Stomach sleepers require a low and soft pillow, or a plush and compressible medium height pillow that will prevent neck craning and back arching, and instead take pressure off the spine and pelvis, and allow the head to turn comfortably to the sides. Large or heavy sleepers should opt for lower and thinner pillows because they exert more pressure on the mattress and sink more into it than light and small sleepers. Please note that this applies to the overall size and weight. Head size and weight, on the other hand, is different because people with large or heavy heads need the support provided by thicker pillows with a higher profile. 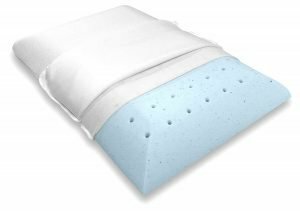 Whereas a soft mattress causes you to sink more and reduce the gap between your natural head position and the bed, a firm unyielding mattress positions your head high above it which necessitates a high-lofted pillow to bridge the gap. If you place only a partial portion of the pillow under your head, you should consider a thicker pillow. But if you place it fully under your head, then a pillow with a low profile would be more suitable. 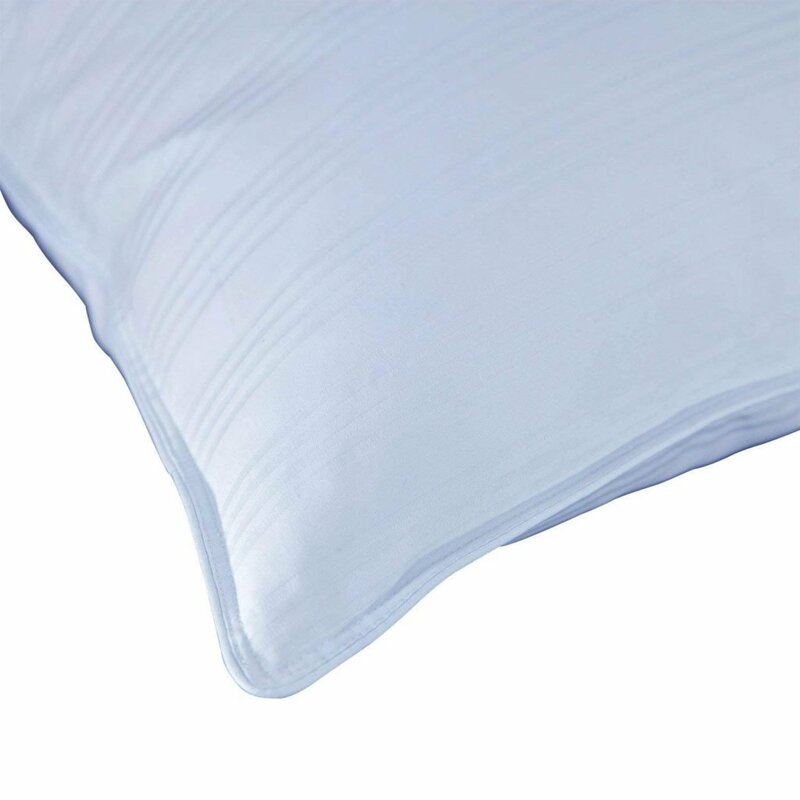 The type of filling material has an impact on the comfort, support, malleability, and durability of the pillow. The following are the most common types of material used to fill out a pillow. Memory foam is known for pressure relief, comfort and contouring capability whereby it conforms to your body shape. This type of fillings makes pillows soft and provides ample support for your neck, head and shoulders. Their downside is the tendency to retain body heat and the initial chemical odor they emit. Gel is sometimes infused into the memory foam to counteract retention of heat. Shredded memory foam is moldable for height adjustment. Down refers to the soft plumage found underneath the outer feathers of birds. They are used for making soft and luxurious pillows which are light, breathable and more durable than other fillings because down becomes finer with age. Their main advantage is that down fillings can be shifted around to adjust the height and firmness of the pillow. However, they are also more expensive than feather ones. Microfiber features similarities with down filling material because it is soft, comfortable and airy for optimal circulation of air. Pillows filled with microfiber are quite expensive. 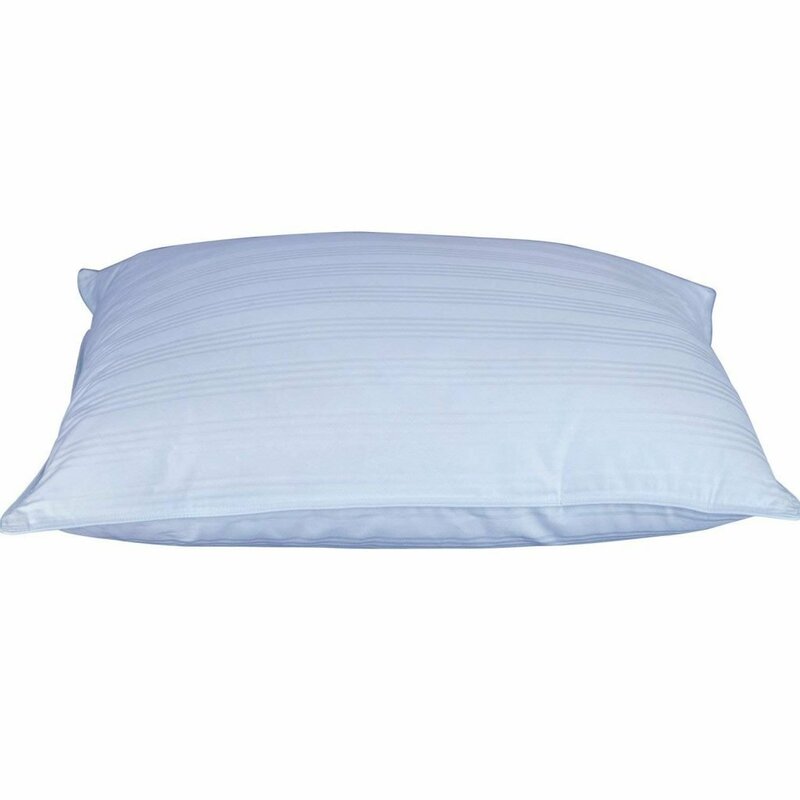 Cotton, polyester, bamboo rayon, and flannel are the most common material used for pillow covers. 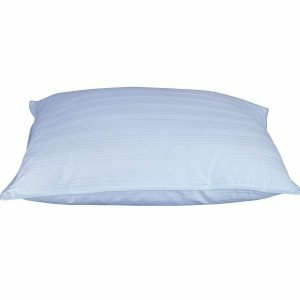 The best cover for a pillow should be soft, breathable, absorbent, removable, easy to clean and machine-washable, and well-knitted or sewn to prevent the filling from slipping out. 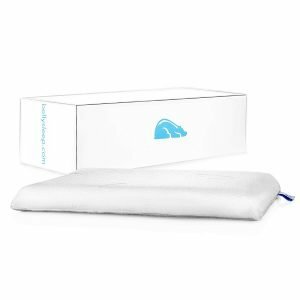 Some pillows like Bluewave Bedding Ultra Slim Memory Foam Pillow and Belly Sleep Gel Infused Memory Foam Pillow include an inner cover to protect the filling. Since your face literally lies next to the pillow, it is essential to select a hypoallergenic cover that will not trigger or exacerbate hypersensitive reactions. Warranty inspires confidence and reviewing its conditions should be one of the critical considerations. You can get this information from the seller or verified buyers online. Unfortunately, this information is not always available as we found out with DOWNLITE Extra Soft Down Pillow. The good thing is that majority of manufacturers avail their warranty conditions as well as other incentives applicable. 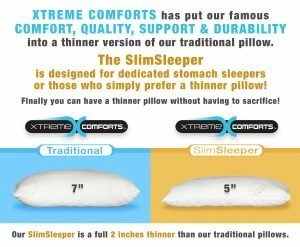 A good example is Xtreme Comforts Slim Standard Bamboo Pillow which comes with 30-day money back guarantee and a six-year warranty. Adjustable height and comfort: Pillows like Pancake Adjustable Layer Pillow come in six stackable layers that can be added or removed to adjust the height of the pillow. This makes them great for stomach sleepers because they can be customized for the optimal comfort and support. They also have zippered sides for easy access. 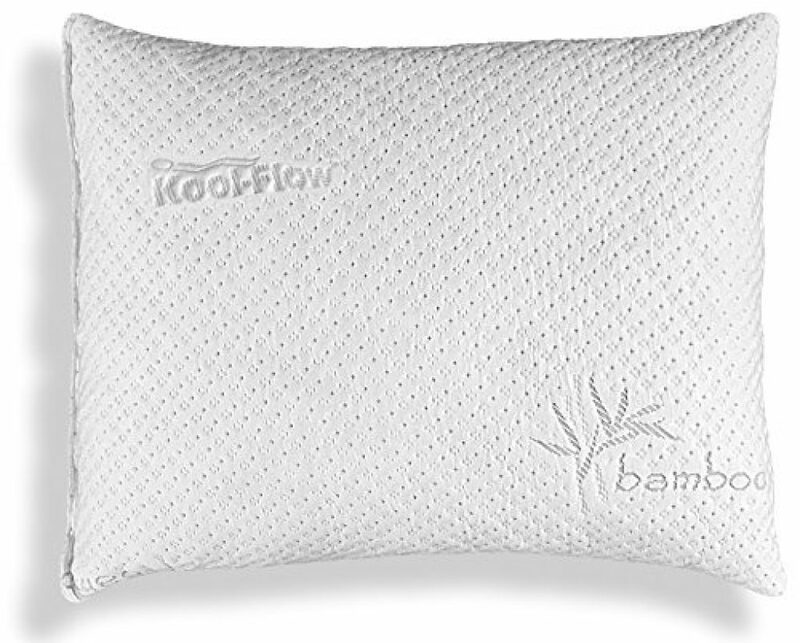 The shredded memory foam filling in Xtreme Comforts Slim Standard Bamboo Pillow and the down filling in DOWNLITE Extra Soft Down Pillow can be molded and redistributed according to your preferences. Machine-compatible: Not all covers are removable, and even the ones that can be removed may not be used with a washing machine or dryer. This makes cleaning them inconvenient and time-consuming. 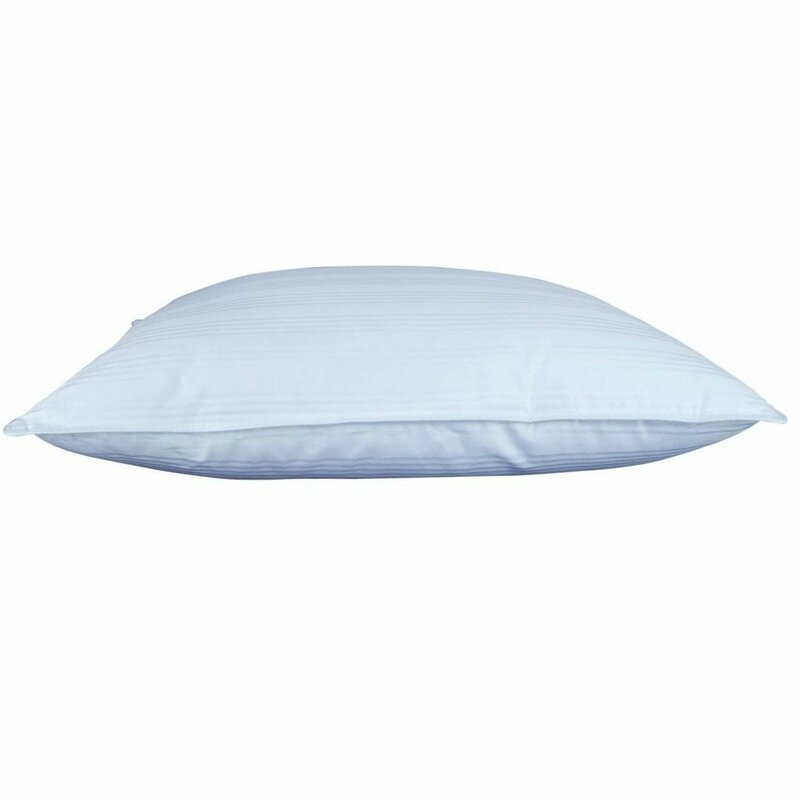 Other sizes available: Pillows that are available in different sizes provide multiple options for our available bed size and other sleeping needs. For instance, Tempur-Pedic TEMPUR-Adapt ProLo Queen Size Pillow is available in King and Queen sizes while Xtreme Comforts Slim Standard Bamboo Pillow comes in three different sizes. 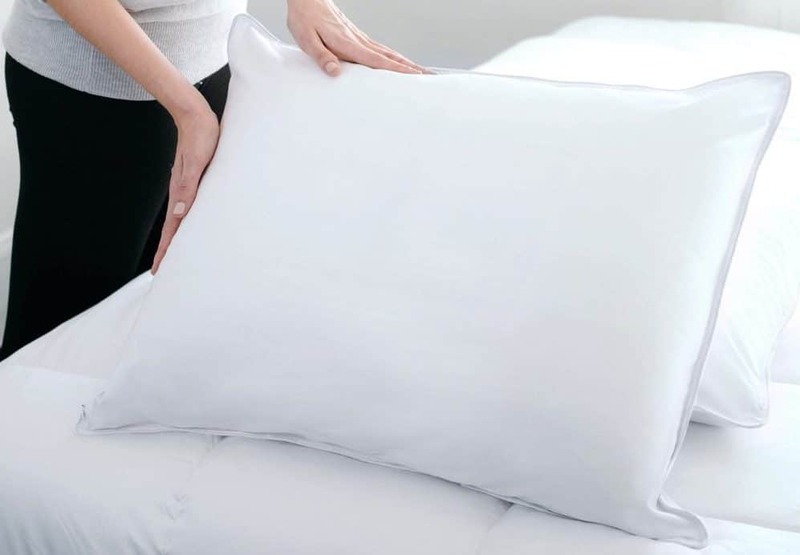 Certification: Considering how close and often we are next to our pillow, it is vital to ensure that it does not expose us to allergens and toxic chemicals. One way to check this is through health and safety certifications awarded by CertiPUR-US and OEKO-TEX. Which firmness is better to choose for a stomach sleeper? 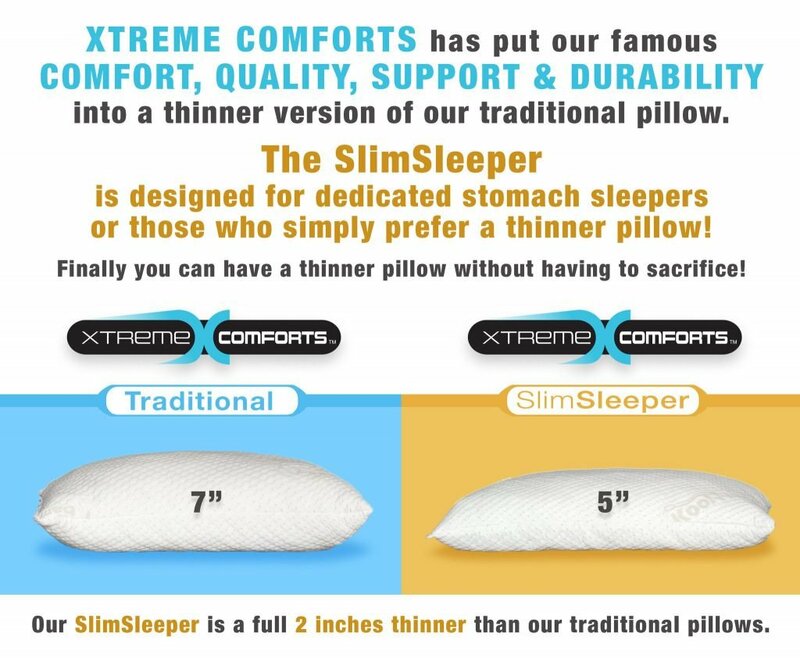 The best pillow firmness for stomach sleepers is soft because it allows the head to sink in slightly and still provides sufficient support for the head and neck to be at level with the spine to maintain its natural curve. It also allows for smooth head turning. A stomach sleeper can also place a low, soft pillow under the pelvis for better body alignment. Are there any special pregnancy pillows for stomach sleepers? There are pillows specifically designed for pregnant stomach sleepers. The best body pillows for stomach sleepers feature an opening to accommodate the expanding belly, and are much longer than regular pillows because they support the whole body and adapt to the changing shape. People in the early stages of pregnancy can safely use regular pillows, such as Belly Sleep Gel Infused Memory Foam Pillow or the stackable Pancake Adjustable Layer Pillow, that are designed for stomach sleepers. These pillows are very thin. Is it comfy to sleep on them? Thin and soft pillows are recommended for stomach sleepers because they are comfortable and supportive for proper alignment of the head and neck with the spine. Otherwise, a thick profile forces you to crane your neck and arch your back in an unnatural angle, thus exerting pressure on the neck, spine, lower back, and pelvis. 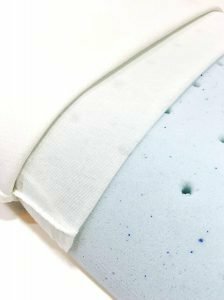 Bluewave Bedding Ultra Slim Memory Foam Pillow was our first choice because it has everything you need in the best firm pillow for stomach sleepers, and it manages any weaknesses you may anticipate. It features a low profile and hypoallergenic memory foam filling which is certified by CertiPUR-US. Since memory foam retains heat, this pillow incorporates gel to keep that under control. It also utilizes unique technology to avoid the stiffness common in other foam models. A 30-day money back guarantee allows you to return the pillow if you are not satisfied. Why buy several types of pillows when you can find all of them in one? 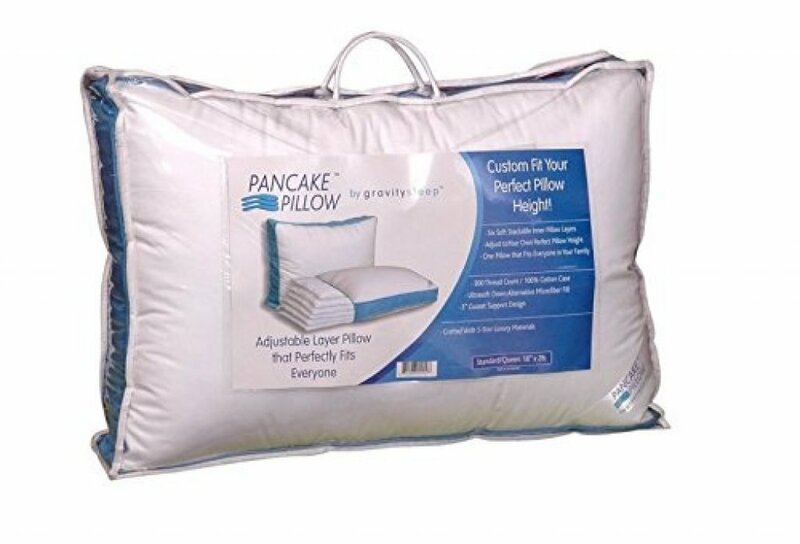 Pancake Adjustable Layer Pillow has six stackable layers totaling a height of ten inches. We loved the flexibility it offers to customize comfort, support and height adjustment. You can even make another pillow with some of the layers. 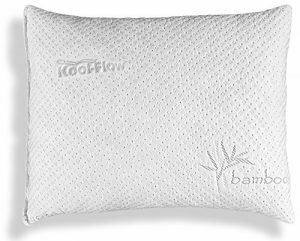 Xtreme Comforts Slim Standard Bamboo Pillow won us over with its versatile shredded memory foam which can be molded to suit any sleeping preference. It is soft, supportive, breathable and CertiPUR-US certified. This pillow is not only our budget choice, but it is also ranked third as the best pillow for stomach sleepers owing to its quality construction, availability in different sizes, 30-day money back guarantee, and a six-year warranty.